She was the last person who boarded the airplane. I remember this distinctly because on this particular flight, for some unknown reason, I scored an upgrade. Despite this stroke of luck, I greedily eyed the empty seat next to me thinking: It would be nice to have that extra space on this long haul. One look at this final passenger and anyone could see she was carrying the weight of the world. About 80, her eyes downcast, her gait stilted, her carriage displayed grief, disappointment and resignation. Melancholy permeated her, but I couldn’t determine if the sadness was recent or life-long. In my quick glance, my mind was made up. I didn’t want her sitting next to me. Yes, that was me at my Christian best praying, Please God, let her seat be in the back of the plane. This could be a great flight without anyone sitting next to me. My weak smile greeted her as she stopped in the aisle by my seat. A flight attendant put her carryon in the overhead bin. I managed to keep smiling as I got up to allow her ample access to her seat. Inside, I was burning. Why, God, why? Could I just once have the seat next to me empty? When she finally sat down, the seat swallowed her. Her skin color matched the gray of the seat covering and without the red blazer she wore, she would have completed disappeared from sight. 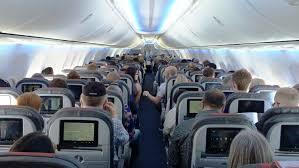 I was still smiling when I grabbed my seat belt and fastened it low and tight across my waist – as the flight attendants suggest. Out of the corner of my eye, I noticed her watching me. Her hands shook slightly as she grabbed her own seat belt and attempted to copy my movements. I turned, still smiling like a stupid circus clown, looking at her face-to-face during her several spastic tries to complete a process that took me seconds. That’s when I heard God answering my selfish prayer. Talk to her! His words practically boomed in my ears. She needs someone to talk to her. I might have still had that silly grin on my face when I answered. No God, I don’t want to talk. I want to relax. I want to sleep. I want to forget the pressures of this business trip. Why are you asking me this? She told me she was flying to Chicago to bury her son. She had never been on an airplane before, never navigated an airport concourse, never submitted to the vulgarities of airport security. Through her grief, she accomplished this because of a deep desire to be beside her son’s family when they laid him in the ground. That’s when I knew. God didn’t want to answer my selfish prayers. His desire was for me to answer someone else’s prayers. Luck didn’t get me this upgrade. It was God who orchestrated the change so one of his children could help another who desperately needed comfort. How stupid I had been. How selfish! God had redeemed my self-centered prayers to be a blessing to someone else. Once we were airborne, she turned to me. “Thanks for letting me know that. I would have been terrified when all that happened.” Now she was the one smiling – barely noticeable, soft and sweet. For the next five hours, over complimentary peanuts and soda, we talked. Mostly she spoke; I listened. Her life was fascinating. Her marriage had been long, full of love and produced two children. They struggled through things that were history to me: the effects of the Great Depression, World War II, the first Super Bowl. Then she reached things I remembered: the moon landing, the US hockey team winning the gold medal over the Soviet Union at the Lake Placid Olympics, Princess Diana’s wedding. This wasn’t a history talk. The news provided the backdrop to committed love: birthday parties, graduations, happy marriages, births of grandchildren and great grandchildren. The melancholy once permeating her was replaced by good memories, by virtue, by love. It seemed only five minutes later when the seatbelt sign dinged on and the roar of the engines grew louder in preparation for our descent. “Thank you for sitting next to me,” I said to her. I didn’t have the strength to tell her throughout our conversation I wondered: What if I learned to pray differently? What if instead of being worried about my comforts, I asked the Lord to help me be kind? What if I prayed not with judgmental eyes, but a heart willing to serve? What if I prayed to be God’s answer to someone instead of waiting for God to answer me? She placed her hand gently on mine. I smiled back at her…warm, admiring and genuine. This entry was posted in Uncategorized on July 15, 2018 by Myra Wells.